Reading your mind sounds quite freaky. Several brain scanning techniques like fMRI, PET, or EEG are capable to analyze what you are thinking, dreaming, or seeing. This is very topclass science you might think. And yes, it is very top class science. Everything is done in research facilities with top of the notch equipment. But suddenly, there is this device, “the Mindwave mobile”, a portable headset which claims to read your mind using EEG-scanning techniques. You can buy it for less than 150 euro’s. How is it possible? EEG is measured through electrodes on the scalp. These headsets can have up to 256 electrodes to measure brain activity. They have so many electrodes to read brain activity per per brainregion. The Mindwave mobile has only 1 electrode so the Mindwave mobile is not capable to read brain region specific but is therefore pretty cheap. So, if the Mindwave mobile can’t read all the brain regions, what can it do? You can connect the Mindwave mobile through Bluetooth with several apps on which you can play focus or meditation games. Examples are games where you should “focus” or “meditate” to achieve a goal. Like move a ball, or lift a balloon. As you can see from the list above, meditation and focus are the opposite brainwaves. Therefore it should be relatively easy for the device to deviate between them. It’s fun and all that I can play a focus game, but how do I know that I am really focusing during this game? For testing whether the Mindwave mobile measures my focus, it should give back highly focused scores when I am really focused. So I need to know that I am focused, and I need the real data. The application (EEG ID) can give me the data. The application is able to read (all) the brainwaves from the Mindwave mobile and exports the data to a data-file. It also filters the data and translates it into two scores: “attention” and “meditation”. For testing how well this device works I needed to design some tasks which correspond with being in “meditation mode” and “attention mode”. I did these tasks while lying on bed to reduce the motion artifacts in the data. First I will look how the individual brainwaves correspond to the given task, and next I will look how the filtered data corresponds to the tasks. What better task can you design than meditation to find the meditation-wave? During my meditation task I lied down for approximately 10 minutes with my eyes closed and focus on the now, my breathing, and my body. I’d expected to find some Delta, theta, and Alpha wave activity during my meditation task. For the attention task I was playing attention games on the app “Mindgames pro”. These are braingames which require a lot of attention to get better scores. I played the game “attention training” and “divided attention” to make sure my attention was high. 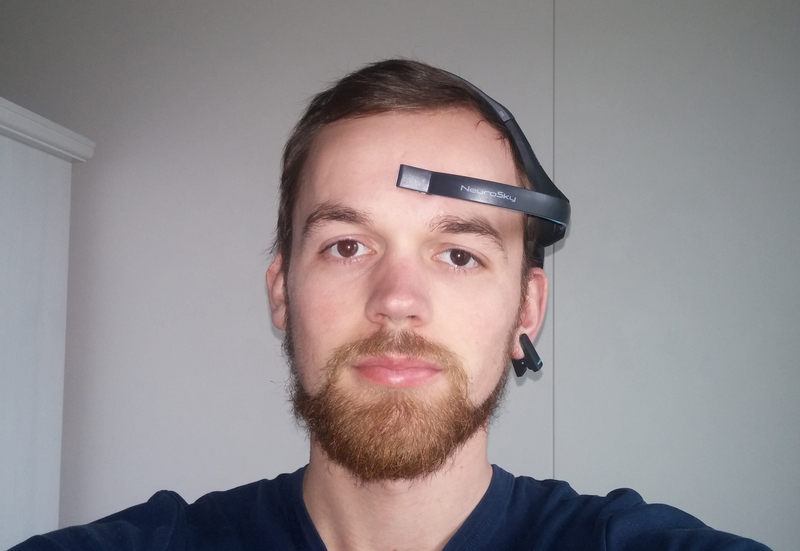 The first thing to note is that every time that I wore my Mindwave mobile it took me at least 15 minutes to connect. According to my applications, the device wasn’t sitting properly on my head. I had to adjust it very often on my head to get a proper signal. Maybe I have a very weird head, but this same problem also happened to my friends who tried it on. Maybe they have a weird head as well… I think it’s save to say the EEG headsets need to be placed very carefully to get proper signals. With the slightest misplacement EEG-wave activity can be altered. So therefore it is better that the device is a little bit picky when you place it on your head. 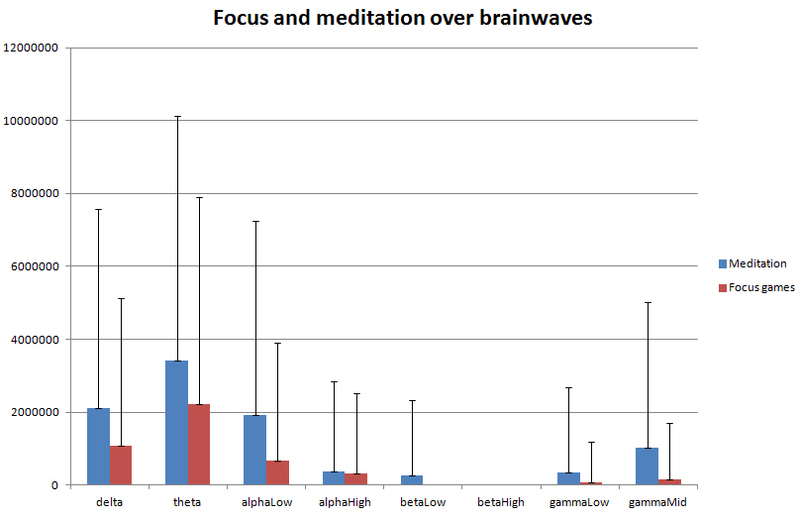 Lower frequency (Delta, theta, alpha) brainwaves should be more present during meditation, while the higher (Beta, Gamma) brainwaves should be more present during the focus braingames. In graph 1 you can see the averages of each wave between each task. If you consider what I had expected, this did not make any sense. According to this data my brain was more meditated, but also more focused during my meditation task. The vertical black lines represent the distribution (in standard deviations) of the data. As you can see, these values are very large, meaning that the data is very widespread. As you can also read the Y-axes, there are data points between 0 and one million. I’ve looked further in the data (for normality and changes over time) and it was obvious that there is a lot of noise in this data. So even when I am lying down there remains a lot of noise in the data. Fortunately, the EEGID app use filters to reduce the noise. After the filtering, the data is transformed in two scores; a “meditation score” and an “attention score”, which are scores on a scale of 0-100. So what do these scores say? While doing my “attention-task” the data gives back two scores; a meditation-, and an attention score. In the next graph (figure 2) you can see the changes over time. On average my attention score was 61.9(SD=14.1) and my meditation score was 59.6 (SD=17.0). Although this was statistically different (T(12545)=73.344,P<0.001), the difference wasn’t that much. During the meditation task my brainwaves were more distinct (figure 3), my attention score was 39.8 (SD=18.2) and my meditation score was 61.4 (SD=9.7), T(50900)=-240.379, p<0.001. That made more sense. However, over the time of my meditation I had the feeling that my meditative state increased. But I could not find this at all in the data. The unfiltered raw-data from the Mindwave mobile does not make any sense. Even when I was lying down and didn’t move a muscle, there was too much noise in the raw-data. But the Mindwave mobile itself also does not claim that it can do that (only the application did). So the filtered “attention” and “meditation” scores (done by the app) would validate the workings of the device much better. And this filtered data looks like to store some information! The patterns which my brainwaves showed during the meditation-task were different from the attention task. In the meditation task the differences between the scores were clear, however on the attention task it wasn’t. Maybe I got sucked into some semi-meditative state while doing a game very focused. Does that sound logical? Reading brainwaves has a lot of interesting features. The first thing what you can do with EEG headset is to control simple things with your mind, for example turning on a light. For doing this you have to think very hard “I want to turn on the light”. The EEG-headset does not read your mind, but it learns from your brain pattern how you think about turning on a light. In time, the headsets learn more and more of your brainpattern and you’ll be able to control things better with your mind. The second thing what you can do with EEG is to learn about personal abilities. For example; theta-wave activity is associated with better memory consolidation. Musician’s Alpha-brainwaves are higher when they listen to music compared to average people. Furthermore in elite sportsman, alpha activity is higher, and more specific in certain brainregions than in amateur sportsman. If that doesn’t excite you, there is something called Neurofeedback. With Neurofeedback your brainwaves are displayed to you directly (or indirectly with an animation) and the goal is to influence your brainwaves, with the goal to increase performance or the suppress symptoms. Dozens of studies have been done with Neurofeedback. One study showed that with training participants learned to suppress Theta-wave activity causing that they performed better on an attention-tasks. Neurofeedback training might be helpful to alleviate cognitive impairment and fatigue. Also for fibromyalgia-patients neurofeedback might be helpful. However, a lot of studies are less positive. Neurofeedback-training failed to support cognitive impairment within children with ADHD. Several studies showed that while participants were able to modulate their brainwave activity, their performance did not change. Although research has showed some exciting possibilities, with commercial use we are far from there. Brainwave activity is often brain region specific and a commercial device like mine is a single-electrode device, and therefore not able to measure a specific brain region. EEG-headsets used in research can have up to 256 electrodes and can measure specific brain regions. Also, wet electrodes are used in research which are currently better than the dry electrodes of most commercial devices (but less easy to use). All and all, as it supposed to, the Mindwave Mobile is able measure the difference between attention and meditation up to some degree. Due to the noise in the measurements, and the single-electrode it is not yet possible measure different brainwaves precisely. But Neurosky also did not claim that the Mindwave mobile is able to measure precise brainwaves, so there is no one to blame. For now the Mindwave mobile is just a toy for fun where you can use your focus and meditation to play a game. In my perception, the exact scores are unreliable to specify the degree of attention or meditation. Nonetheless, I must say that Neurosky had the courage to start a new, very interesting area for the development of commercial EEG-headsets. In the future, new headsets will provide more and better electrodes and will therefore be better. What is waiting for us? Hi Justin, I had a similar experience with Neurosky with respect to difficulties in connecting and trying to make sense of the data. Thanks for the writeup.